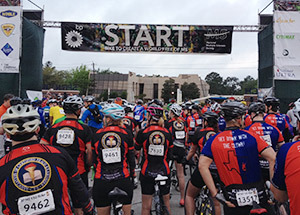 For the last three years, ACFE staff members, their friends and family have formed Team Intangible Assets to complete the BP MS 150 — a 170-mile bicycle ride in April from Houston to Austin, Texas — to raise awareness and funds for research for the cause, treatment and cure for multiple sclerosis. ACFE volunteers work tirelessly behind the scenes all weekend to supply the riders' needs. From tent construction to luggage hauling, these tireless helpers keep their feet planted firmly on the ground so their comrades can successfully make the wheeled trek from one city to another. Thornton-Hranicky said that she joined the team because she wanted to be involved in the entire process. "That first year was rough. I knew someone on another team and asked him what we would need, but we weren't quite prepared for some unforeseen circumstances," she says. Those circumstances included an incredible wind that pulled the Velcro apart on their tents, an inefficient method of gathering the riders' luggage and amenities provided by race organizers that, let's say, were a bit too Spartan. break from the BP MS 150 bicycle ride to have lunch with Dr.
Dr. Wells; and Leslie Simpson, CFE, director of events. SPHR, CBP, human resources manager. Over the years, Thornton-Hranicky says they've learned to be more self-sufficient. 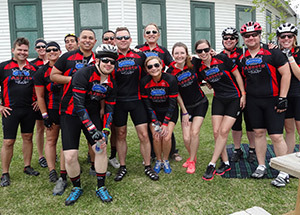 In the first year, as the riders arrived at the midway point in La Grange, Texas, they had to make the trek over to the main campground for the race-provided meals. The ACFE volunteers now provide meals that are waiting at the tents of the exhausted riders. It's psychologically and physically important to take care of the riders at the midway point so they can be rested for the next grueling day of riding. They set up cots for riders and a private changing area. They've hired a masseuse to knead out cramps and tightness. They ensure the tents are erected and sturdy so they block the wind. At the end of the race, the riders had been required to search for their luggage and personal belongings from a huge collection site. Now the volunteers use a borrowed trailer to haul the luggage the entire ride from Austin, to Houston, to La Grange and back to Austin; the riders no longer need to look for their luggage. As Thornton-Hranicky asks, "Who wants to search for luggage when you're exhausted?" Thornton-Hranicky says her favorite aspect of volunteer duties is seeing the riders off at the beginning and greeting them as they ride into the ACFE parking lot at the end. "It feels like they are my riders. It is the best feeling to watch them and it is very rewarding to be able to provide for all of the riders," she says. "It's nice to hang out with coworkers and their families when they're pushing themselves to the limit, seeing them succeed. I feel proud to be part of it all." The team also thanks ACFE Founder and Chairman Dr. Joseph T. Wells, CFE, CPA, and ACFE President James D. Ratley, CFE, for their continued sponsorship and support of ACFE's Team Intangible Assets. Emily Primeaux is assistant editor of Fraud Magazine.